I am always so mean when I wind a shuttle that this kind of thing happens all the time. I need to wind a new shuttle just one repeat from the end.... I will, I will, but not right now. Here is a long bit of beaded tatting which I started, but then found I didn't quite have enough beads... I may work out a solution, or I may just give up. Then a couple of weeks ago Fox shared some thread, Finca 16 in bright colours, which inspired me to start something new. 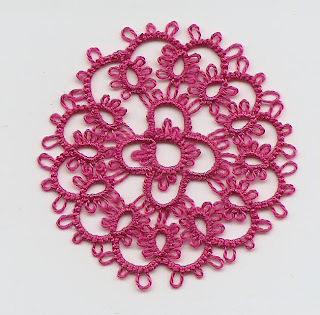 and also started the Yes-U-Can doily challenge on in-tatters. That edging is truly lovely- looks like little violets. 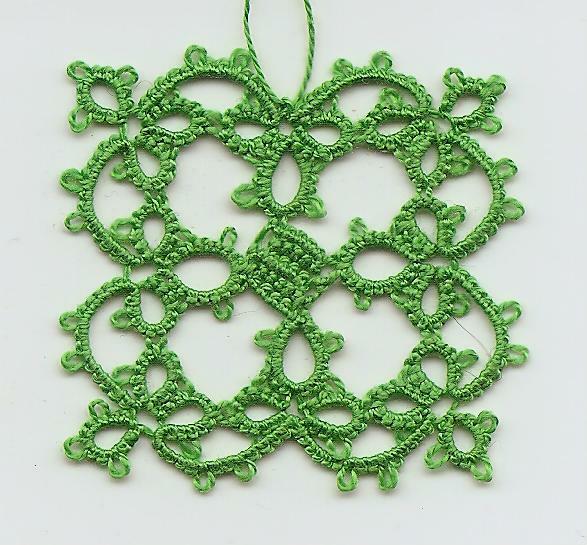 I love that green beaded border - is it yours? The green beaded piece is a necklace from the Pascale Provost book. Only I am not so sure about it now as I was at the beginning...it looks a tad 70's when I hold it up to my neck. However I may get my act together if only to get rid of the box containing it and those pesky beads! How do you cope with them, Fox, they are always escaping and disappearing into the carpet or between floorboards, that is why I no longer have enough for the completed project, grr! Your tatting is lovely by the way - I love the edging! Double over a piece of masking tape and stick it in a little tin or pill box or mint tin or something like that. Then plop the beads on the tape! Voila! I love your tatting !